Lock in a great price for Dar Zaman - rated 8.9 by recent guests. I loved the room, the seclusion, the charm of the place and the people who run it - who certainly made it a fascinating experience. The location and helpfulness of the staff. The excellent breakfast and evening meal. Friendly and helpful staff, Hassan especially always ready to help you, any advice about where to go to eat and what to visit, was always extremely successful. 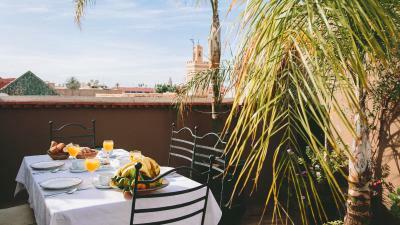 The Riad is clean and the breakfast is excellent with fresh squeezed orange juice, fresh fruit, freshly made yoghurt crepes, pastry and if you want also friend eggs. They also do evening meal (we find out only near the end of the stay) and the food was fantastic. 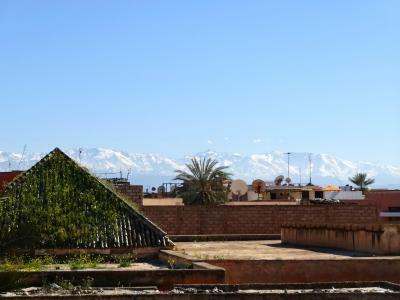 Location wise, is next to the suk, so it is walking distance from a lot of must see locations (YSL garden and secret garden as example) they also arrange trips outside Marrakech to vary your staying there. The Dar was tastefully done up with lush bougainvillea and a wonderful terrace. Our stay at the Dar Zaman was wonderful. The house itself is cosy and intimate with local characteristic. 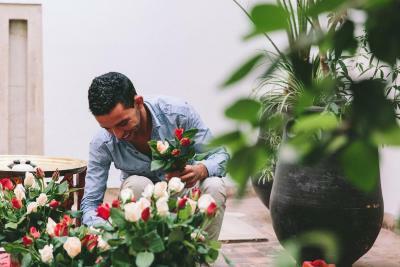 The staff is the heart and soul of the riad: Hassan and Yassine were really kind and tended to all our needs, even made arrangements and reservations for us. Truly personal and heartfelt customer service. The staff were fantastic! The two guys who were running the riad were really friendly and had lots of recommendations of where to go/avoid while we were in Marrakech. Definitely worth booking! The staff were very helpful and friendly, made sure we felt comfortable once we got out of the crazy medina. They gave us great tips on how to navigate through the streets and which restaurants are good and which aren't. Breakfast was delicious, we were able to eat it on the terrace which was very lovely. Room was clean and very comfortable, the bed and sheets were amazing and the shampoos and body gels smelt very good! The hosts were absolutely outstanding, tending our every need and giving us a very thorough explanation of the city (best spots, what to do, etc). Breakfast was amazing and the terrace at the top too. Location was great - in the Medina but not too far from the entrance or the souks. Hassan and Yassim and the other staff were amazing. Nothing was too much effort. 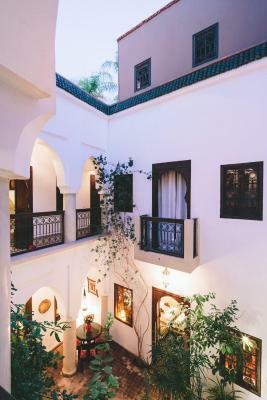 Dar Zaman is in the heart of the Medina, just minutes from the Marrakesh Museum and Jamaâ El Fna Square. It offers an interior courtyard with a plunge pool and fountain. 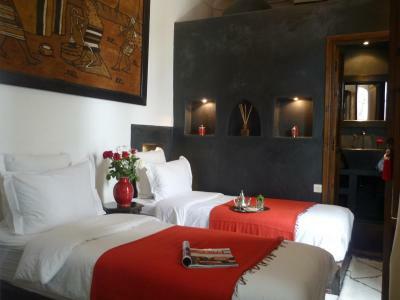 The guest rooms at the riad have free Wi-Fi access and are air-conditioned. 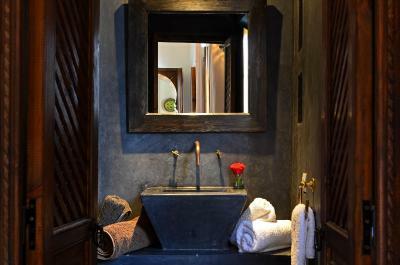 Each has a private bathroom and is decorated in a traditional Moroccan style. 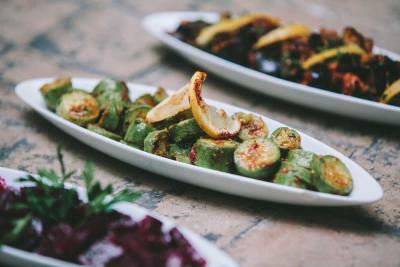 Dar Zaman’s restaurant serves gourmet Moroccan cuisine, using fresh local ingredients, along with a daily continental breakfast. 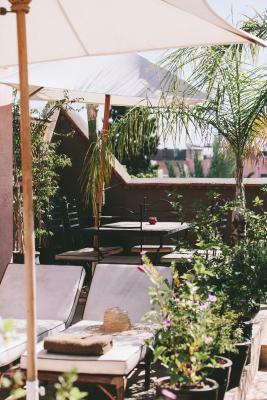 Guests are invited to relax on the terrace, overlooking the Medina rooftops and the Atlas Mountains in the distance. 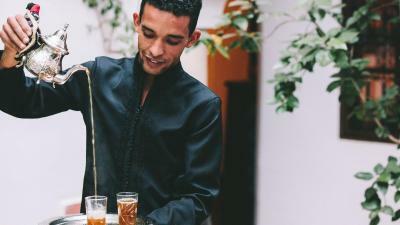 Riad Dar Zaman offers numerous activities, such as cooking classes, camel rides and excursions outside of Marrakech. Dar Zaman has been welcoming Booking.com guests since 30 Jul 2009. When would you like to stay at Dar Zaman? A private balcony with views of the courtyard are offered in this room. The double room opens onto a sun terrace. This room features a fireplace. You can add 1 extra bed to this room. 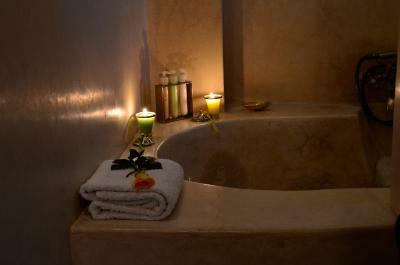 This room offers a en suite bathroom with a shower and a tadelakt bathtub. 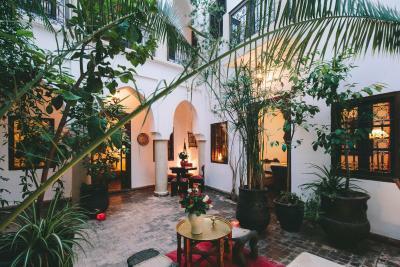 Dar Zaman is in the northern part of the medina, really close to several great restaurants, the main souks, La Maison de la Photographie and the historic Medersa Ben Youssef. You'll get a real insight into life in the ancient medina. House rules Dar Zaman takes special requests - add in the next step! Dar Zaman accepts these cards and reserves the right to temporarily hold an amount prior to arrival. In order to preserve the peace and tranquillity of Dar Zaman, the hotel does not normally accept bookings for children under the age of 12 unless they are in a group that occupies the whole hotel. This establishment is English-speaking and English-managed. There are also French, Spanish and Portuguese speakers. Please inform Dar Zaman in advance of your expected arrival time. You can use the Special Requests box when booking, or contact the property directly with the contact details provided in your confirmation. We were there in Jan, and didn't expect the temperature at night to be so cold. The riad is not really geared for this: the window of our room, didn't look properly so we had draft of cold air during the night. Even if Hassan fixed the problem as soon as we brought to his attention, the room was still fairly cold even with the small electric heater and the aircon. Also, in the first few days, even if there is a fireplace in the breakfast room, the fire was not lit, so the room was quite cold and we had to have breakfast with jacket. The place is quite compact with only four rooms and limited shared spaces. The rooftop terrace is a very nice addition, though. 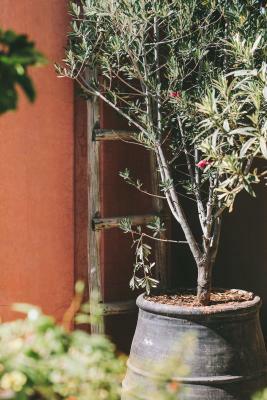 Like most riads, Dar Zaman is located in a cul-de-sac, so finding your way there might be a little challenging in the beguinning. The staff will meet you in the square when you arrive, so you don’t have to find the way alone. 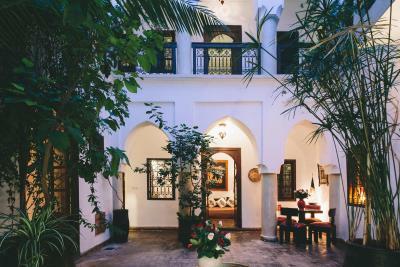 Dar Zaman is a lovely spot of peace and relax in the middle of the busy Medina. My wife and I spent here 3 nights and we felt in love with the place and the people working there. I suggest, especially if you arrive at night, to organise the transport with them: a driver will wait for you at the airport (we had delays with the passport control and he waited for us 3 hours!) and one of the guy working at the Riad will meet you at the taxy point and bring you at the Riad (cars cannot go further than that point). 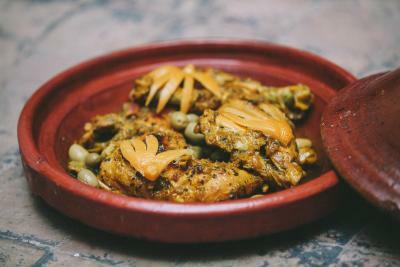 Once you walk to the Riad once with them, it's easy enough to find - which is a great thing in the Medina! 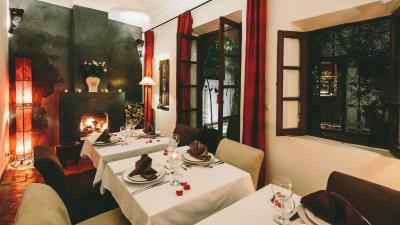 I also suggest to book the dinner at the Riad for the day you arrive, it is very nice! The place it's beautiful and really calm and quiet. Peter, Hassan, Yasin and all the team working at Dar Zaman do an increadile work! They are always nice and very helpful, ready to go the extra mile for their guests: they make the difference and they are the value added to this beautiful place! Book without hesitation, you will not be disappointed! The door to the room we were in didnt have a secure lock, though the riad itself is very secure and a room safe was provided, I would have felt a bit more comfortable being able to lock the door too. Excellent friendly place and very reasonable. Room was a little dark and small. Very friendly and helpful staff. They always gave good advice for directions and places to visit etc. Our hot water wasn't working at first at after two tries the staff member was able to get it working, he was very friendly and helpful and immediately tried to fix the problem for us. We stayed in the terrace room and it was great except for two things: too small (could barely open our cabin baggage) and the shower was not working properly (too weak, going cold all the time, really ruined it for us). Also you can listen to everything outside, including other guests hanging out on the terrace. The staff were extremely knowledgeable and helpful. The food prepared for us was wonderful! Great bedding and designer bath supplies. What outstanding hosts! !